It’s time for another Windows Phone report from AdDuplex. At the time of this writing Winter Olympics are underway in Sochi and we decided that recent Olympic host countries would make a good list of countries to cover. This report is based on data collected from 3310 (symbolic number, right?) Windows Phone apps running AdDuplex SDK v.2. The raw data analyzed was collected over the day of February 18th, 2014 (UTC time) unless otherwise stated. We have made every attempt to consolidate different reported phone model names under their canonical retail model names, but it is possible that some of the rare model name variations were not accounted for. 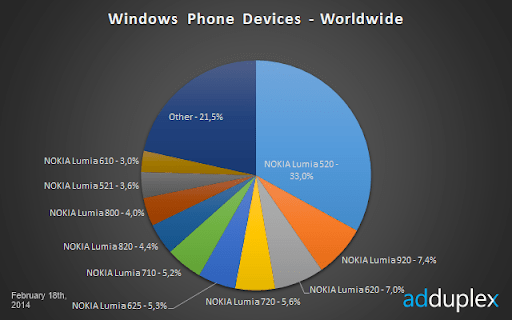 Worldwide statistics show little surprises this month as Lumia 520 only strengthens its positions from a month earlier and now holds 33% of the total market. Other changes include the shift between Lumia 710 and 625, the former losing its 5th position in the global ranking to the latter. Again, no newcomers are on the map as other category remains at 21.5%. It is hardly surprising that Nokia is dominating the manufacturers market, though it is still interesting to see the size of it. 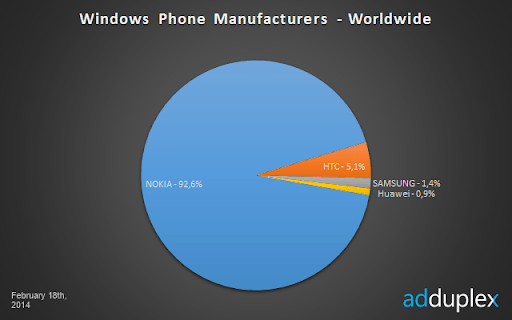 Compared to January, Nokia gained additional 0.3% stealing 0.1% from each of the competitors depicted above. After it stumbled for a month, we now see further growth in Windows Phone 8 OS version across WP devices, as it now crosses 4/5 benchmark. It will be interesting to see how long before Windows 7 OS remains in a single-digit portion of the chart. Only slight differences are observed in the US market. 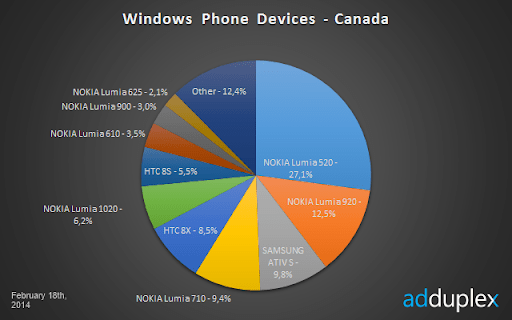 Lumia 52x models are still holding the lead. It is interesting to note that while 521’s share shrank a bit, the 520 has added almost 3%. On the bottom end of the TOP 10 we can see Huawei W1 dropping out and Lumia 925 coming in at #9. Family Mobile (a Walmart brand on top of T-Mobile’s network) is a new member in this section as it has now a tangible 2.7% of the market. It is worth mentioning that AT&T has managed to significantly strengthen its position as the leading operator and now holds more than 36% of the market. T-Mobile remains the second most popular operator in the US though it did lose 3.5% compared to January’s report. United States hosted Winter Olympics in 2002. If China is different in many aspects, WP devices market is no exception. Lumia 520 is holding a second position with only slightly more than 1/10 of the market (11.6%). Surprisingly, 920 is still the most popular device according to our February’s report. China hosted Summer Olympics in 2008. 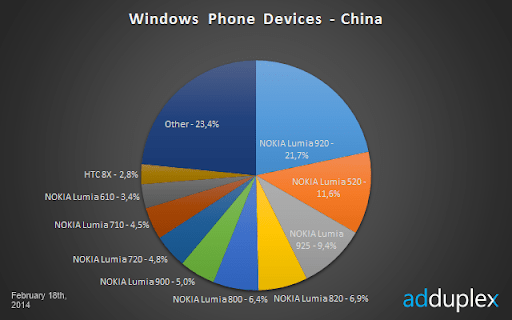 As expected in our October‘s predictions, Lumia 520 overtook Lumia 920 and is now leading the market with more than 20%. Even though Samsung ATIV S has lost some of its market share, it is still in the 3rd place, while HTC 8X even managed to improve its share and now holds 8.5%. It will be interesting to see what happens to non-NOKIA WP devices in the coming months. Canada hosted Winter Olympics in 2010. 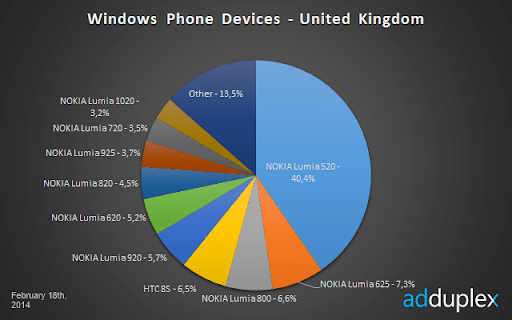 Lumia 520 has again improved its positions as the most popular WP device in the market in the UK. Notice how Nokia Lumia 625 became the #2 device in the country being only #10 a few months ago. Other devices have only slightly changed their market share. United Kingdom hosted Summer Olympics in 2012. 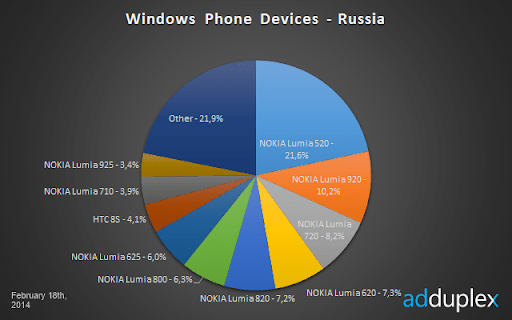 In Russia, market division remains mostly stable with Lumia 520 dominating the market with now over 21%. 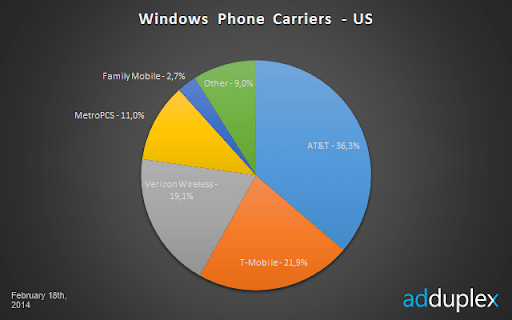 Lumia 920 and 720 remain the other TOP WP devices in the country. Russia is the host of the current Winter Olympics in Sochi. 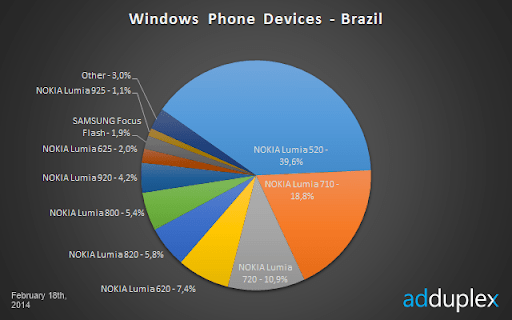 In Brazil, Lumia 520 is definitely dominating the market with close to 40% of the industry. Lumia 710 and 720 hold the other two positions in the TOP 3, which is worth noticing in comparison to most of the countries reviewed. Both Lumia 800 and 820 have lost part of their market share and now account for 5.4% and 5.8% respectively. Brazil will host the next Summer Olympics in 2016. While Spain hosted Summer Olympics in 1992 (Dream Team anyone?) and would technically (though hardly) qualify for the theme of this report, we are including it as a bonus for a different reason. Next week Mobile World Congress will attract tens of thousands of industry professionals to the beautiful city of Barcelona and we are eager to meet you there. Please get in touch if you would like to meet! We covered Spain in our December’s report and it looks like there were some changes. 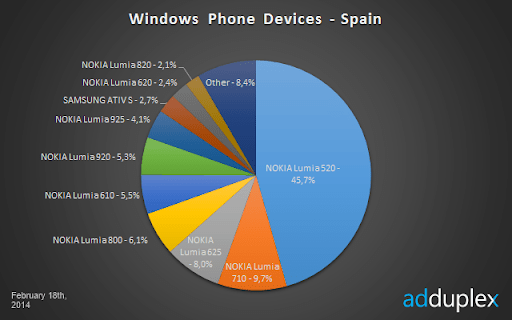 For starters, Lumia 520 is holding probably the strongest position compared to any other country and is coming to close to dominating half of the Spain’s market with 45.7%. 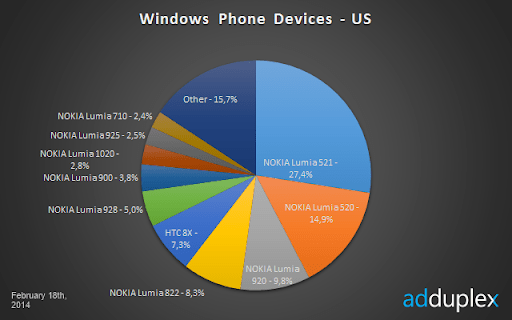 Lumia 625 climbed up to the third position with 8% and Lumia 920 lost its share and now has 5.3%. AdDuplex is the largest cross-promotion network for Windows Phone and Windows 8 apps empowering developers and publishers to promote their apps for free by helping each other. AdDuplex was established in January 2011 in Vilnius, Lithuania. As of February 2014, close to 7,000 apps actively use AdDuplex to gain more visibility.